What, where, and when is jazz? To most of us jazz means small combos, made up mostly of men, performing improvisationally in urban club venues. But jazz has been through many changes in the decades since World War II, emerging in unexpected places and incorporating a wide range of new styles. 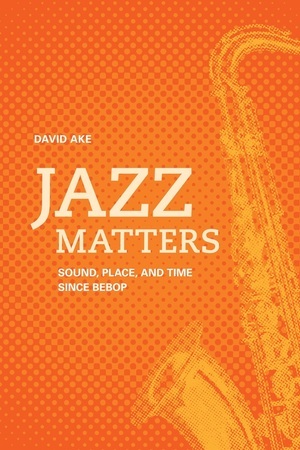 In this engrossing new book, David Ake expands on the discussion he began in Jazz Cultures, lending his engaging, thoughtful, and stimulating perspective to post-1940s jazz. Ake investigates such issues as improvisational analysis, pedagogy, American exceptionalism, and sense of place in jazz. He uses provocative case studies to illustrate how some of the values ascribed to the postwar jazz culture are reflected in and fundamentally shaped by aspects of sound, location, and time. "Engagingly written, [Jazz Matters] is replete with keen, sometimes provocative, insights that will set many readers’ minds a-whirring." "Ake offers an engaging and eclectic alternative to much jazz studies fare by examining seldom-considered subjects and reading familiar ones through unconventional means. I came away from Jazz Matters knowing that I had learned something new regarding the practices of writing about, listening to, and playing jazz. "—Eric Porter, author of What Is This Thing Called Jazz?